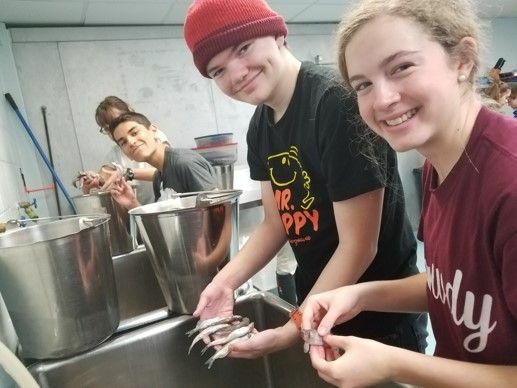 The Science and Language Arts Departments are once again offering a unique opportunity for students to explore many issues that plague the health of our oceans today in Winter Term’s Marine Conservation Experience. Students will explore the history and current challenges of marine conservation/ecology from a unique set of perspectives: marine biology and literature. Students will explore several important conservation efforts in western Travis County by taking field trips to see different ways natural resources are protected and conserved. As part of the curriculum, the participants will be introduced to literary giant John Steinbeck and his good friend marine biologist, Ed Ricketts. We will explore their collaborative project The Log from the Sea of Cortez which chronicles a marine collection trip they made together. Reading excerpts from the book will allow students to see another view of the need to preserve our marine resources, and to hear from an important voice in the early development of the field of marine conservation. The highlight of the class will be an 8-day, 7-night field trip to Galveston to experience firsthand the challenges facing conservationists today as they work to preserve the marine ecosystem. We will team up with several different resources including A&M Galveston Marine Science Department, NOAA, Moody Aquarium, the Galveston Bay Foundation and others. Students will be actively involved in individual research, journaling, fieldwork and literary exploration. We have made every effort to keep the expenses for this class at a minimum. The cost to partake in this class is only $850 per student. This includes travel to and from Galveston, 7 nights lodging in a private beach house, all activity fees, and all meals taken during the trip. Students will also receive a field notebook for use during the class and a copy of the novel, The Log from the Sea of Cortez. Students interested in applying for this Winter Term class should fill out an application by Monday, October 29. Links to the online application can be found in posters located around the school. You can also get a link to the application by emailing Mr. Council or Ms. Priour. A short informational meeting for parents will be held Tuesday, October 30, at 6:00 p.m. in room 406 to answer any questions about this trip.